Three-wheeler manufacturer Piaggio Vehicles said on Tuesday that it will re-enter the scooter segment by introducing its 'Vespa' model by March next year and is also evaluating a possible foray into the motorcycle segment. 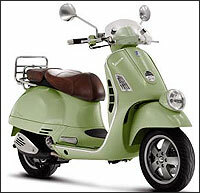 "We are setting up a new facility with a 150,000 unit initial annual capacity to launch the Vespa. We will announce it at the auto expo and it will be in the market by March," Piaggio Vehicles chairman and managing director Ravi Chopra told reporters on the sidelines of an Automotive Component Manufacturers Association (ACMA) summit in New Delhi. The Vespa will sport a 125-cc engine and will be a gearless model. "For re-entry into the scooter segment, we had announced an investment of 30 million euros. The capacity of the plant will be expanded to 3 lakh units annually by mid-2013," Chopra said, adding that the facility is being set up at Baramati, in Maharashtra. He said the company is looking to sell the scooter mainly in the domestic market. business and the market opportunities are immense. We are doing a very comprehensive feasibility study to launch motorcycles in India." He, however, declined to share on details such as when the company is likely to take a final investment decision on the proposed foray, or when the study is expected to be complete. When asked about Piaggio's R&D initiatives, Chopra said, "We are developing a new 200-cc petrol engine which will mark our entry into the petrol, CNG and LPG options. The engine will be ready by June, 2012." The engine is being developed for three-wheelers and it will be sold in domestic, as well as overseas markets. The company currently manufactures only 1.0-litre and 1.2-litre turbo-charged diesel engines. On its capacity expansion plans, Chopra said the company recently hiked its three-wheeler production capacity from 800 units per day to 1,000 units per day. "We are penetrating more into the rural market," he added. When asked if the company will increase prices of its products, he said: "We are in the process of evaluating the hike. Once finalised, we will pass it on to customers."